Struggling with ideas for high school reunion gifts, centenary celebration ideas or reunion mementos for any other important occasion? Look no further than the quality, custom glassware and ceramics available at C.R. Hose Glassware. Our great range offers incredible inspiration for class reunion ideas. Why not get a custom printed coffee mug with your school logo to commemorate an important 10 year reunion? Or maybe you’re researching family gathering ideas, and think a beautiful glass etched with the family crest might be the perfect keepsake? Whatever the need, you can rely on C.R. Hose Glassware’s seven decades experience in decorative glass crafting to ensure you get something truly memorable. Call us today on (03) 9781 1966 to discuss our incredible range, and how to bring your wedding, gathering, school anniversary and family reunion ideas to life. Perfect school reunion ideas are just around the corner when you look into the great range of custom glasses and mugs we can create. 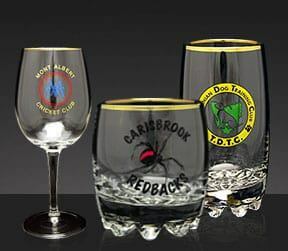 Have your school crest decorated on a beautiful wine glass or any other item from our range. With incredible attention to detail, genuine C. R. Hose Glassware class reunion ideas are the kind of memento that will last a lifetime. Available in bulk ordering, it’s perfect for people organizing their school anniversary, a great idea as a memento that everyone can take home and solves the problem when brainstorming ideas for high school reunion gifts. Alternately, commemorating an important anniversary or milestone for your school or club itself, rather than a graduating year, can take full advantage of the C.R. Hose Glassware range. Centenary celebration ideas for schools, universities, sporting clubs or more could be accompanied with an etched wine glass for important alumni and faculty that they can take home and treasure forever. Just call us today on (03) 9781 1966 to inquire about the possibilities available at C.R. Hose Glassware. When it comes to family reunion ideas, finding perfect reunion mementos can involve a lot of time and effort, especially when it comes to something that feels personal to your clan. Well, why not get custom engraved glassware, or custom printed ceramics, to commemorate an important family gathering or the milestone birthday of a beloved family member. Want to enquire about how we can make your family gathering ideas a reality? Click through to our Enquiries page and fill out our simple online form. Attach an image of your design to your form and we’ll discuss the best way to turn it into a memorable keepsake. Alternately, chat to us at (03) 9781 1966 for a touch of design expertise. Providing in-house design assistance, we can help you choose the perfect layout, font and style for your event, anniversary, reunion or celebration.